Combination bit has a black iron mouth and a copper link, it features 2 3/4" rings and a 16.5mm mouth. 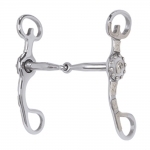 This stainless steel curb bit has a 4-1/2" medium port copper mouth and 6" cheeks. This stainless steel curb bit has a 5-1/2" medium port copper mouth and 6" cheeks. 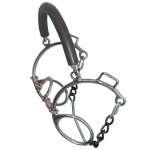 5" sweet iron snaffle mouth with copper inlay, 6" cheeks and German silver floral concho and trim.